Peter Thiel at the National Press Club in D.C. this morning. 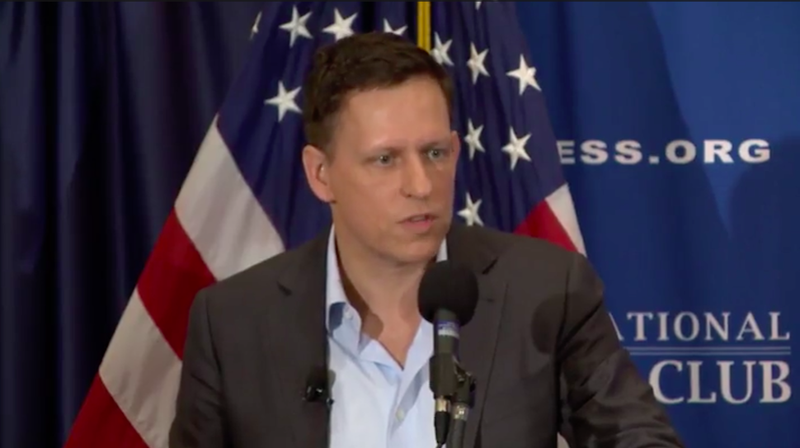 At a speech at the National Press Club in Washington, D.C. this morning, Silicon Valley billionaire Peter Thiel laid out his rationale for supporting Donald Trump, characterizing him as the only candidate with the ability to challenge establishment politics. The Palantir co-founder and Facebook board member has recently come under fire for his support of Trump, and many members of Silicon Valley’s elite circles have publicly distanced themselves from him. Yet despite this—he remarked that the climate in Silicon Valley is “more polarized than [he] realized”—he doubled down on his support for the candidate. He frequently described Trump, to whose campaign he recently donated $1.25 million, as an outsider. He painted him as the better alternative than Hillary Clinton, whom he criticized as, among other things, a war hawk and an establishment lackey. “Trump’s agenda is about making America a normal country,” he explained, seemingly in direct contradiction to his candidate’s oft-touted slogan. Thiel suggested that America’s problems—a trade deficit, an expensive healthcare system, the involvement in a number of foreign conflicts—were the result of politicians who wanted to keep the status quo in place because it benefitted them. “Voters are tired of being lied to,” he said. In what essentially amounted to a stump speech, Thiel also waved away worries about Trump’s temperament and personal conduct. When asked during a question and answer session following his speech whether putting the sentient merkin in charge of the country’s nuclear codes might be a bad idea, Thiel demurred. Thiel also contrasted the interests of people in Silicon Valley—of which he is certainly one—with the interests of the majority of Americans. He repeatedly referred to the country’s “bubbles” and “elites,” particularly “coastal bubbles,” arguing that they’ve helped shipwreck the country.